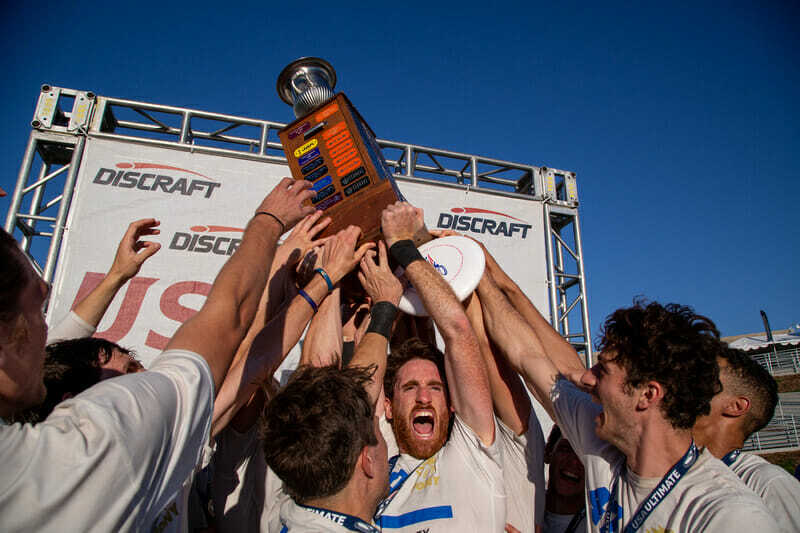 SAN DIEGO — After a thrilling weekend of bracket play, champions were crowned on Sunday at the 2018 USA Ultimate National Championships. Philadelphia AMP avenged a loss in last year’s final, defeating Seattle Mixtape 15-8 and winning their first-ever championship (and the first club championship for the city of Philadelphia). San Francisco Fury defeated Boston Brute Squad 14-13 on double game point in the best game of the day to win their second straight title. The game was a defensive masterclass from both teams. Fury gutted out the win with an Opi Payne strike cut as players on both teams were beset by exhaustion. In the final game of the weekend, New York PoNY handed San Francisco Revolver their worst loss of the decade, 15-7. PoNY followed up on their Pro Championships win with an even more overpowering performance. They had just five turnovers — four from their D-lines, one from their O-line. More coverage from the 2018 National Championships is forthcoming on Ultiworld! Comments on "AMP, Fury, PoNY Win 2018 National Championships"